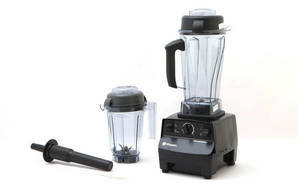 Snapshot: The Vitamix Total Nutrition Center super blender has 10 speeds and comes with a plastic (BPA-free) jug. How does it rate? Excellent at pureeing frozen fruit, crushing ice, chopping carrots and grating parmesan cheese. Excellent at making nut butter, sorbet and soup. Very good at making a green smoothie and milling almonds. OK at making pizza dough. Motor cuts out if jug tilts off shaft during processing. Small chute for main jug and narrow chute for dry blade jug. Unit can jolt on the bench when processing heavy ingredients or processing for an extended time. Very noisy on high speed. Dry blade jug to process dry ingredients costs extra.